If you have travelled Interstate 95 North from Florida through Georgia and South Carolina, you have probably seen the signs telling you about South of the Border. 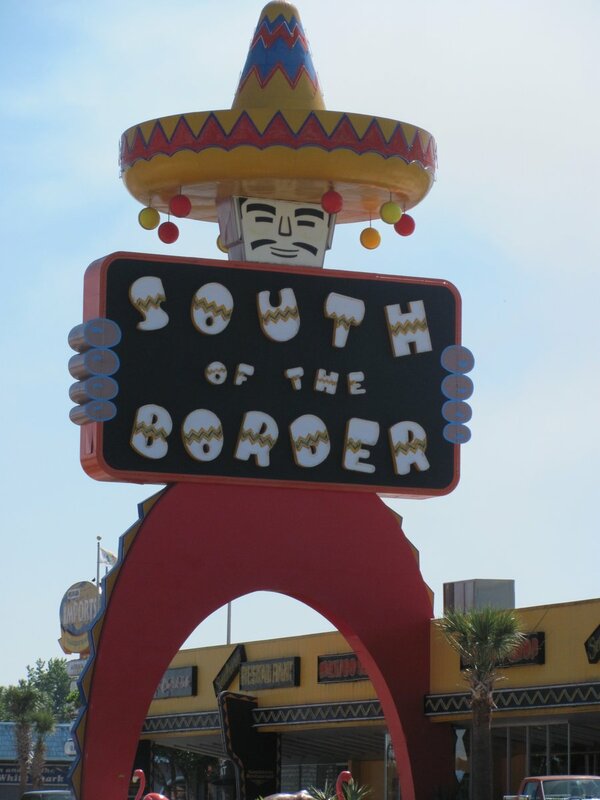 South of the Border is a tourist trap at the SC/NC line. After years and years of seeing the signs urging me to visit, I felt like I had to go just to see what it was all about. Yes, I knew it was a tourist trap but my curiosity got the best of me. Once we took the exit to South of the Border, I saw a hotel, reptile lagoon, gift shop, and a small amusement park. I did not go to the reptile lagoon because I did not have a desire to see a bunch of snakes. The hotel, with its faded paint, looked like a downgrade from Motel 6 from the outside. Not commenting on the number of stars of the hotel per se becasue I don’t know what the rooms look like. Just saying, it did not look like much from the outside. The amusement park was not open but the rides looked like fair rides for children. I do not have children, so I did not check that out either. The place is as kitschy as you can get. I thought that they go overboard with the stereotypical depiction of Mexican people. Brightly colored ponchos and other souvenir items were for sale in the gift shop. Back in its hay day, I am sure that South of the Border was probably a happening, lively excursion for the enjoyment of the entire family. Now days, they probably need to figure how to revamp the place, slap on a new coat of paint, and come up with some activities to attract more people. Water park anyone? Overall, since I do not have children, there is probably not anything that would inspire me to go back.